ANXO Cidery & Tasting Room (711 Kennedy St NW) – Far, far from the maddening crowds, mere blocks from the NW/NE border, ANXO has opened up a Cidery & Tasting Room. Good for them, it is quite nice. The Vaquero panino (a hot sandwich they prepare with a press in the bar area) was tasty and the cider collaboration I tried (with Snowdrift Cider Co. – I think Collaboration #8) was enjoyably sweet and crisp. I also learned there is a cidery called Snowdrift from Washington State. My Take: Cool space, will definitely return. 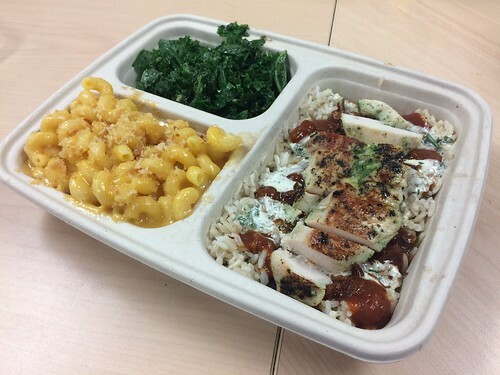 Farmbird (625 H St NE) – The new fast-casual place that wants you to stop eating boring chicken. The two plates I tried were solid (I’ll take the Barbecue Ranch Plate over the Chipotle Masala Plate). Get the Mac & Cheese as your side – the best I’ve had in recent memory. So cheesy with perfectly crunchy bread crumbs. My Take: Will return, if nothing else for the Mac & Cheese. 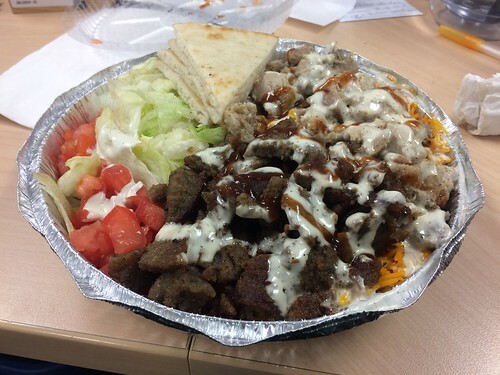 The Halal Guys (814 H St NE) – A new gyro and chicken place based on the popular New York chain. The menu is small, so you can’t take too many risks. I ordered the Chicken & Gyro Combo platter and walked away thinking it was a good lunch. My Take: Not to die for like the hype suggests, but I will pop-in for lunch now and again. CaliBurger DC @ Wunder Garten (1101 First St NE) – CaliBurger DC (making California-inspired burgers around the world – think In-N-Out) did a free burger giveaway at their new food truck pop-up inside Wunder Garten, and I waited in the very long line in the pouring rain. Was it worth it? Not a bad burger at all, but try something else if you find yourself cooling your heels in the rain. My Take: If I’m hungry while at Wunter Garten, why not? Mason Dixie Biscuit Co. (2301 Bladensburg Rd NE) – I made it to their new brick and mortar location and had to try the fried chicken. It was good but not my favorite, the pieces were on the smaller side. But I love the biscuits and made sure one was included. Next time, I’ll go with a classic biscuit sandwich for sure. My Take: It’s too far away without a car, but I’ll definitely find my way there for the biscuits. Chick-fil-A (1401 Maryland Ave NE) – Yep! It is here and causing traffic problems! Eat mor chikin. My Take: So close to my house, I may get tired of eating chicken!